They are not much to look at, but this is a vine flower. 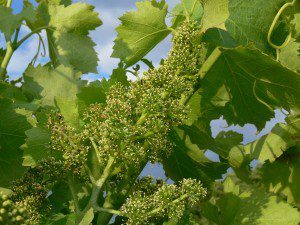 The bunch of tiny vine flowers turns into a bunch of delicious grapes. The weather in May was very dry (we only had 13mm of rain, 7mm of which was on 1 May) and warm. The last few days have been hot and this led to flowering starting on 1 June, a few days earlier than last year. There is a rule of thumb that harvest is 100 days after flowering, so we could be looking at harvest in the second week of September (last year we did not start the harvest until 28 September), but in practice much will depend on the summer. So fingers crossed for hot days, cool nights and rain at just the right times!